The Nonhuman Rights Project vows to continue to argue that the chimps’ capabilities require that they have the same fundamental rights as humans. Others have disagreed that this is not a “personhood issue” but rather a human responsibility issue. On Lawyer 2 Lawyer, hosts Bob Ambrogi and Craig Williams join guests, Steven M. Wise, president of the Nonhuman Rights Project, and Richard L. Cupp, J.D., the John W. Wade professor of law at Pepperdine University, as they discuss the recent legal ruling involving captive chimpanzees, the debate over animals as “legal persons,” animal rights, animal law, and next steps. Steven M. Wise is president of the Nonhuman Rights Project, the only civil rights organization in the United States working for the legal rights of nonhuman animals. Richard L. Cupp, J.D. is the John W. Wade professor of law at Pepperdine University, where he teaches torts, products liability, remedies, and animal law. Steven M. Wise: I think if we look at this as a hundred-year problem; hopefully, we’ll see a continuation of the strong evolution we’ve had in the last 10 or 20 years with regard to animal protection and animal welfare, I think we’re closer to the beginning of that evolution then towards the end of there or toward the — we are at peaks, I think we’re going to see more-and-more concern and we treat animals appropriately. I applaud that. My plea is that we focus on welfare and human responsibility rather than pretending that animals are people. Richard Cupp: For the same reason that human beings must have rights or their fundamental interests will not be protected, so nonhuman animals, who have the wherewithal to have the fundamental rights, their interest can only be sufficiently protected in one way that is they have legal rights. 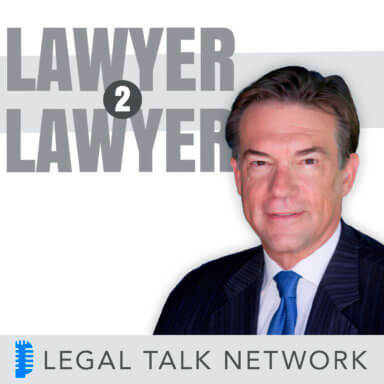 Intro: Welcome to the award-winning podcast Lawyer 2 Lawyer with J. Craig Williams and Robert Ambrogi, bringing you the latest legal news and observations with the leading experts in the legal profession. You’re listening to Legal Talk Network. J. Craig Williams: Welcome to Lawyer 2 Lawyer on the Legal Talk Network. I am Craig Williams coming to you from sunny Southern California. I write a legal blog called May It Please the Court. Bob Ambrogi: And this is Bob Ambrogi coming to you from Massachusetts, where I write a blog called LawSites. I also host another Legal Talk Network show called Law Technology Now. J. Craig Williams: Before we introduce today’s topic, we’d like to thank our sponsors, Clio and Litéra. Clio is cloud-based practice management software. It makes it easy to manage your law firm from intake to invoice. Try it for free at HYPERLINK “http://www.clio.com” clio.com. And Litéra, Litéra is the authority on document creation, collaboration and control, increase your productivity, collaborate securely and ensure protection of your vital information. You can learn more at HYPERLINK “http://www.litera.com” www.litera.com. Bob Ambrogi: Well, three years ago on this show, we did an episode about legal efforts in New York to seek habeas corpus release of two chimpanzees, Tommy and Kiko. Tommy is a chimpanzee caged in a warehouse in Gloversville, New York and Kiko is in Niagara Falls, New York. There’s been a new legal development in that case and we’re going to talk about it today. In a recent legal ruling by New York Appeals Court, the court struck down the habeas appeal brought by the Nonhuman Rights Project. The court held that the project did not have the right to seek second writs of habeas corpus on behalf of Tommy and Kiko and found they didn’t have personhood essentially that would give them habeas corpus rights. The Nonhuman Rights Project intends to appeal that decision and seek further review in New York. J. Craig Williams: Well, despite that setback, the Nonhuman Rights Project vows to continue to argue that the chimps’ capabilities require that they have the same fundamental rights as humans. Others have disagreed that this is not a personhood issue, but instead a human responsibility issue. Bob Ambrogi: So today on Lawyer 2 Lawyer, we’re going to take a look at this recent legal ruling involving chimpanzees and the legal rights of chimpanzees and of animals more broadly. And whether animals should have legal rights as similar to the way people do and what the next steps might be in this legal matter. So to help us do that today we have two guests. First of all, let me introduce Steven M. Wise. Steven is the Founder and President of the Nonhuman Rights Project. He’s practiced animal protection law for 30 years throughout the United States. He is the author of four books including Rattling the Cage: Toward Legal Rights for Animals and also Drawing the Line: Science and the Case for Animal Rights. Welcome to Lawyer 2 Lawyer Steven Wise. Steven M. Wise: Thank you for having me back. J. Craig Williams: And Bob our next guest is Richard Cupp, J.D. He is the John W. Wade professor of law at Pepperdine University in Malibu, where he teaches torts, products liability, remedies and animal law. In addition to his work on torts and products liability, Professor Cupp writes and speaks extensively about the legal and moral status of animals. Welcome to the show, Richard Cupp. Richard Cupp: Thank you for having me. It’s great to be here. Bob Ambrogi: So Steven, perhaps you could begin by telling us what happened in this most recent ruling. The Supreme Court New York, Supreme Court Appellate Division in Manhattan issued a decision on June 8, 2017. What happened there? Steven M. Wise: I think you pretty much covered it. The holding appears to be that we don’t have the right to file a second or seek a second writ of habeas corpus on behalf of Tommy and Kiko, the two chimpanzees. And then they threw a lot of dicta in about why they think we probably wouldn’t win anyway even if we did. Bob Ambrogi: So that was dicta, had that issue already been decided by other courts at this point? Steven M. Wise: The only court that has looked that issue is the Third Department, the one that came down recently was the First Department. The Third Department was a previous case involving Tommy. That Court had said that you had to be an entity that was able to assume duties and responsibilities if you wanted to be able to have right. I think the interesting thing about that is that within the last few months, the Nonhuman Rights Project was able finally to track down the sole source that they had used for really their primary citation, which was to the meaning of person in Black’s Law Dictionary, in fact, that had been one of the main issues that we had talked about in oral argument as well. And the issue had been that that the Nonhuman Rights Project said that in order to be a person you have to be able to have either assume rights or duties while the court was saying no it’s rights and duties, and then they cited Black’s to support them at a number of cases that had also cited Black’s. So when we went back to Black’s within the last few months, we looked at that, the source. I think it was the Tenth Edition of Salmond on Jurisprudence. We had a lot of trouble finding it but we actually found that — we found the Tenth Edition finally in the Library of Congress and it was not to our surprise what it said was, you have to be able to have rights or duties. In other words, it supported us and it did not support the courts. However, Black’s is the one who had misinterpreted it. And we actually wrote the editor-in-chief of Black’s and said you got this entirely wrong and the courts now are citing that your definition of person meaning someone who must be able to assume duties and responsibilities instead of duties or responsibilities. And Black’s immediately wrote back and said, whoops, we’ll make sure that we correct that in our next edition of Black’s. So the decision itself now is left substantially unsupported. We actually brought that later to the attention of the First Department by motion asking them to look at the correspondence between us and Black’s. And the court denied our motion and presumably refused to look at the fact that Black’s had recanted and then proceeded to make the exact same error that the Third Department had. J. Craig Williams: Where does the slippery slope go on this? What happens with respect to any animal that may have rights? I mean, there are arguably animals that are — or other animals that are closer to a human in terms of intelligence, I know chimpanzee might be, but where does this go? Where do we stop? Steven M. Wise: Oh well, let me explain something. This is something else that the First Department just simply — it’s something they went off kind of on a frolic of their own. The First Department frankly had no understanding whatsoever of what our arguments were. Our arguments were based not on intelligence or anything else. The only thing our arguments were based on was the fact that chimpanzees are autonomous beings. And we had based that argument on the fact that as a matter of liberty and equality in the State of New York, the judges in the in the State of New York value autonomy even more than they value human life, according to their case law. And so, we had then made our arguments that humans are not the only autonomous beings in the State of New York that there are chimpanzees who are autonomous in the State of New York, and our liberty argument and our quality argument were both based solely on the autonomy of chimpanzees. Unfortunately, the First Department simply did not understand that and the word “autonomy” and the word “equality” and indeed the word “liberty” itself in the context of our arguments were simply were completely absent from their decision. They seem to have thoroughly misunderstood what it was we were arguing. But if you do understand it, then you can see that the nonhuman animals who we are arguing ought to be able to have at least the right to bodily liberty that’s protected by a common law writ of habeas corpus are those beings who we can prove are autonomous beings. And to date, we have been arguing that chimpanzees are autonomous beings. We believe and we’re about to file other cases that we can prove that elephants are autonomous beings. The other great apes are autonomous beings, orcas are, whales and dolphins. After that, we really haven’t made an argument past those nonhuman animals. There is something interesting, by the way, I have got an increasing number of media requests and media interviews as well as having even a judge or two talk to me about the question about how our arguments are going to affect the coming arguments concerning the emergence of the possible rights of Artificial Intelligence entities who may soon figure out some way of becoming autonomous, and they think that potentially the arguments were making for the legal rights of a nonhuman animal such as chimpanzee may also have some kind of effect on the issue as to whether an autonomous Artificial Intelligence entity ought to have rights as well. Bob Ambrogi: That’s really interesting. Richard Cupp, you filed an amicus brief in this case and it seems to me — if I understand the gist of your position, it’s somewhat what the court said that if there are going to be rights there also have to be responsibilities and that chimps don’t necessarily have the capacity to exercise responsibilities. Tell us what your position was rather than me trying to say it for you? Richard Cupp: Well, sure, and not surprisingly Steve and I have very different perceptions of a lot of the issues that we’re talking about. It’s at a core, a foundational aspect of our society that at least in a broad way legal rights and legal personhood are connected to legal responsibility. And a lot of the affidavits that Steve’s group put together for the most recent case involving the First Department, they talked about various nonhuman animals having some abilities that they could describe as bearing responsibilities, for example, we have all seen that mothers with mammals, in particular, probably other species as well, will have something you might think of as a sense of responsibility toward their children or that groups of animals might have response — feel a sense of responsibility to the others in the group. And I wrote an amicus brief that was very much in favor of strong protection for chimpanzees and other animals, but focused on a human responsibility perspective which might call Animal Welfare, as opposed to what I would consider the pretense of saying that that these were going to pretend like they are persons, a concept that I think is very dangerous. And one of the things that the court recognized in the recent decision is that any argument that a chimpanzee or another animal can have some sense of responsibility, kind of misses the boat on what the key issue is. The key is, is the norm within the community the ability to have enough of a sense of duty or responsibility, enough moral agency that we feel comfortable imposing society standards and laws on those creatures. And because no chimpanzees have enough moral capacity of which we are aware where we would feel comfortable saying we are going to presently under our current legal system put you under arrest or try you because you have engaged in an act of violence or something like that, it doesn’t make sense to talk about them as being legal persons. Instead, you have to focus on the people who do have the entities which happen to be human people, who do have moral responsibility and say to them, look, if chimpanzees are being kept in a little box that’s not big enough, if your laws allow that currently, you’ve got to change your laws, you’ve got a moral responsibility to change your laws or to enforce your laws better, and to put all of the focus where it really no matter what language we use, it’s going to end up being a human responsibility issue. If you say that a chimp is a person, all that will do is have a human stand-in as a representative of the chimp sort of like a guardian ad litem and still be making arguments and humans will make decisions regarding the chimp. It really is going to be a human responsibility issue no matter how you dress it up, but there are extreme dangers, particularly the vulnerable humans who themselves have low intelligence, if we start getting concepts of intelligence, Steve says, autonomy, but notice that the animals that he is talking about are all highly intelligent animals and I think it was a good question, what about the slippery slope? How much intelligence do you have to be able to be autonomous? So when we start looking about at the intelligence of an individual as a pathway toward personhood, it really raises unintentionally I believe, some scary scenarios with regard to the humans that have the least intellectual capability. My concern is that overtime if we start including in our considerations of who is a person some sort of individual intelligence analysis, we’re going to erode our enthusiasm for the healthy degree of rights that we afford people who have severe cognitive impairments. We afford those rights based on their membership in the human community with the most defining characteristic they have being a human rather than anything having to do with their autonomy or anything having to do with their intelligence. So in a nutshell that’s my position. Also, Steve was right in pointing out that the court rejected considering the change to Black’s Law Dictionary because it really didn’t impact the decision that the court made. It was not by any stretch the sole basis of the earlier Third Department New York court’s decision and it cites old — if you go back to this old Salmond text that they are talking about, they’re saying, yes, a king can have rights without responsibilities and a slave can have duties without having rights. Well, we don’t have kings anymore and we don’t have slaves anymore. So those notions historically where we have called someone a person based on one or the other just or not at all a fit with our modern jurisprudence. Bob Ambrogi: Steve, do you want to respond to that issue at all? Steven M. Wise: I never thought you would ask. Yes, I have several responses. One is that the arguments that we are making are not that you must have the certain degree of intelligence or autonomy in order to be eligible for any kind of the right. Our argument, in other words, we are not saying that in any degree of intelligence is a necessary condition for rights. We’re simply saying that under New York law that autonomy is a sufficient condition, that if you are autonomous you should be able to have certain kinds of rights that protect your autonomy, but we certainly do not argue that autonomy is a necessary condition. So there are likely many, many sufficient conditions, and all we’re saying is that autonomy is one of them. Second of all is the sort of right and the courts continue to confuse this. There are certain rights that don’t have anything to do whatsoever to do with your intelligence, your ability to be able to have duties or responsibilities and those kinds of rights are claim rights. When you want to make a claim say you want to be able to sue over a contract or sign a contract, then you’re hoping that both contracting parties have certain kinds of intellectual wherewithal to be able to do that. That’s why children can’t sign contracts, for example. However, the sort of rights we are arguing are called Immunity Rights, that like the right not to be enslaved. Humans under the Thirteenth Amendment, for example, have a right not to be enslaved, no matter who they are. It doesn’t have anything to do with your mental wherewithal. We’re arguing that chimpanzees — autonomous chimpanzees should be able to have the immunity right similarly not to be enslaved and just like it has nothing whatsoever to do in humans with their intelligence or their ability to be able to bear duties and responsibilities in humans, it shouldn’t have anything to do with chimpanzees either. The third thing is that there has never been an English-speaking court that’s ever ruled the way the New York courts are with respect to chimpanzees. No court, no English-speaking court has ever in the history of English-speaking judges, English-speaking lawyers ever connected the ability to be able to bear duties and responsibilities to the potential to have like a fundamental right not to be enslaved or a fundamental right to bodily liberty or fundamental right to bodily integrity. The only time that has ever happened has been in our two cases involving chimpanzees, all of a sudden the court begins linking them, but the last 800 years of common law there has never been any such link, and they don’t even bother trying to explain why they would make a link. They simply do it. And we’re saying, I think what that does do is illustrate that they have a certain kind of bias against what we’re asking for and that they are willing to really move away from the fundamental values and principles that they themselves hold and had used not only they, but their brother and sister judges for the last 800 years and they are making what is an arbitrary decision that is meant to cut out chimpanzees and any other nonhuman animal. This is the sort of reasoning if you want to call up that, that we have seen, and that my students I talk about, I have shown cases, for example, even beginning with the Dred Scott case where all of a sudden Dred Scott seeking a certain right and why can’t he have it or if he’s not White, well, what does that have to do with anything, didn’t you hear me, he’s not White. We talk about a California case in 1854 where a Chinese person was unable to give evidence in a courtroom against a White person, why could the Chinese not do it because he’s not White because he’s Chinese, and that’s it. We talk about the case Lavinia Goodell in 1879 in Wisconsin Supreme Court where she wants to be a lawyer and the court says, you can’t be a lawyer, why? Because you’re not a man. But there’s no reason why you can’t, it’s just that why you’re not a man. The same thing with the Standing Bear case where Standing Bear was a Ponca Indian Chief in 1879 and he was thrown into jail, his lawyer sought a writ of habeas corpus and the United States government argued that a Native American was not a person the way Richard Cups arguing the chimpanzee is not a person, and therefore because they’re not persons, they were not allowed to even receive a writ of habeas corpus. Luckily in that case the federal judge said, now I’m going to find that the Ponca Indian Chief Standing Bear is a person. But these sorts of arbitrary distinctions, you’re not White, you’re not a man, you are not whoever the majority folks are, who want to keep whatever privileges they have, they simply say, you’re not like us, therefore no matter what kind of characteristics you have. For example, if you look at the chimpanzee cases, it’s clear that what they are against chimpanzees and if the chimpanzee had the mental wherewithal to walk into court and make his own argument he would still lose in the grounds that a chimpanzee as a chimpanzee cannot be a person. This is simply arbitrary judicial reasoning. Bob Ambrogi: All right, Steve, we’re going to continue this conversation of whether chimpanzees should have legal rights, but before we do that we need to take a quick break to hear a message from our sponsors. So please stay with us. Advertiser: Imagine what you could do with an extra eight hours per week. That’s how much time legal professionals save with Clio, the world’s leading practice management software. With intuitive time tracking, billing, and matter management, Clio streamlines everything you do to run your practice, from intake to invoice. Try Clio for free and get a 10% discount for your first six months when you sign up at their website, HYPERLINK “mailto:www.%20clio.com” clio.com, with the code L2L10. Documents are the currency of business. They represent you in every business interaction. Executives need to know what changes have occurred in documents, what metadata risks exist and how to encrypt, share, and collaborate securely. Litéra simplifies the document creation and collaboration process to protect you from risk and loss of reputation. Litéra offers better solutions for document lifecycle management so you can focus on doing what really matters; HYPERLINK “http://www.litera.com” www.litera.com. Bob Ambrogi: And welcome back to Lawyer 2 Lawyer. This is Bob Ambrogi and with us today is Stephen M. Wise, Founder and President of the Nonhuman Rights Project, and Richard Cupp, the John W. Wade Professor of Law at Pepperdine University, and we’re discussing a recent legal ruling involving captive chimpanzees and the debate over whether animals as legal persons should have status as legal persons or other legal rights. And not to kind of jump back and forth here, but Richard, I do want to give you equal time, and Steven was just responding to you, and I just wanted to come back to you and ask whether you wanted to address what he was just saying in response to you. Richard Cupp: I would love to and Steve’s understandably enthusiastic about his position, he just got a lot of stuff to talk about in both of those periods they had. So I’ll try to be kind of brief, but first, I’ll start with the last one because I think it’s most important to shoot that down and the notion this is arbitrary and the connection to slavery or racism or anything like that. Obviously, slavery, racism or odious, slavery was a completely irrational distinction. There is no reason to treat any human being differently with regard to slavery from another human being. So the law evolved to recognize that and later than it should’ve that got rid of the distinction. And then all the other stuff I’ll just say I put in the same category. Yeah, if something’s arbitrary or irrational, I hate it and want it not to be there, but it is rational to look at human beings as a distinctive group where the rights of those who do not have the capacity to bear legal duties are anchored in their membership in the human community. We think of a person with severe mental disabilities first as a human rather than some entity with — let’s measure whatever, its capacity for autonomy might be. Now we think of an infant as a child appropriately, that’s the most logical base identification for the entity rather than their specific level of autonomy or their abilities, and thank God for that, I don’t want to think of humans with severe cognitive impairments differently in any manner then I think in terms of their personhood as — with regard to how I think of anybody else. So there’s a distinction, but it’s a distinction that makes sense rather than an arbitrary distinction and then briefly just I had some of the other points anyways, first saying — we’re saying that it’s not the only basis for personhood to have an autonomy or I think a term is used before is Practical Autonomy. But we’re just adding a basis. Well, the other basis that really jumps out is the basis of being human, and that’s if you look at the history of children’s rights or look at the history of rights for people with severe mental disabilities, the courts and the people advocating for those rights have said basically were denied the full humanity of these people if we’re not giving them full rights, the problem is if you say — we’ll open up a separate door or an additional door where we start looking at he wants to say, autonomy today, which I can’t quite see how that is not connected to some level of intelligence or ability. If we open up the door in that direction, again more I will repeat myself too much, but I’ll just say there’s a significant long-term danger of eroding our enthusiasm for the personhood of humans who don’t have that new capacity, that new basis for personhood that all the other people, all other humans have, well, yeah, plus a lot of animals have, you’ll find some humans who have less mental capacity than some intelligent animals and those are the people that I’m concerned about using this route instead of focusing on human responsibility. Mr. Wise also talked about the fact that you have some rights without duties and some duties without rights and that’s really not an issue at all here, we’re not talking about what’s sometimes called facility and analysis, there’s a famous professor named Hofeld who came up with the line of reasoning, and I think it’s fairly uncontroversial that Hofeld wasn’t talking about who is a person, he was talking about attributes of rights assuming that personhood existed. So really this argument precedes any detailed analysis of does a specific right correlate to a specific duty? We can easily find that a right — or not all specific rights correlate to specific duties and still recognize the obvious basis of our society that at a broad level the concept of rights is connected to the concept of duties whether you would tie each specific right to a correlating duty or not. And then finally, he mentioned that there’s no precedent doing what this Court has done. Well, the obvious reason is, no one’s raised this issue in this way. It’s a radical claim that’s being made in these lawsuits and courts are having to consider really some new issues so rather than that being in argument against the court’s decisions it’s really just understandable that no court has had to do this before because courts have previously only seen personhood or almost always only seen personhood argued in the context of humans or their proxies corporations are just groups of humans, and I’m going to put arguments about the benefits and problems with corporate personhood to the side, because I think you can either like person corporate personhood or not like corporate personhood, it doesn’t change the issue that corporations are viewed as persons because they’re viewed as proxies for humans. So it doesn’t take away the human connection with personhood. J. Craig Williams: We’ve talked about the slippery slope for animals, but let’s take it the other direction. What happens in this sense of Artificial Intelligence with machines, I mean at some point we will reach creating a data from Star Trek that will look and walk and talk and act like us, but it’ll be a computer. Bob Ambrogi: It will be the disembodied voice of Scarlett Johansson if you’ve seen the movie ‘Her’. Steven M. Wise: This is an issue that as I said has been coming to me more-and-more often, so much so that I’m about to sign up for a course in Artificial Intelligence because I realized that I need to know a lot more than I do now. The folks who are working or at least some of the folks working in the area of Artificial Intelligence look at the sort of arguments that we are making and even though they’re not lawyers, they’re very, very smart people. They realize that the arguments that we are making are applicable to the question of what happens as Artificial Intelligence entities actually potentially and I don’t know whether they ever will, but they potentially become autonomous beings; that they can get kind of a head start or computer scientist kind of put them together. But then they go outside of the control of the computer scientists. The EU is already dealing with that problem. They have a series of regulations that they’re working on is to liability, who’s liable when someone makes a robot who then begins to act in a way that was unpredictable and causes certain kinds of damages. That’s one way in which people are looking to us for advice as to how you deal with it. But a second way is just what happens when Artificial Intelligence entities gain a certain amount of autonomy or even a tremendous amount, and should they then be treated as persons who have certain kinds of rights? Also, if I may just toss one thing really fast, courts are now beginning to find not just corporations or persons or ships, that’s been going on for the last hundred years, but just in the last year, the New Zealand Parliament has denoted a river, the Whanganui River as a person, who has certain kinds of legal rights. A national park in New Zealand last summer was denoted a person who has certain kinds of rights. A judge in India two months ago found that the Ganges River has certain kinds of rights is a person, the glaciers feeding the Ganges River is a person. And perhaps most spot-on for us is in November of 2016 about seven months ago, an Argentine judge in Mendoza, Argentina accepted the kinds of arguments that we are making, have been making in the State of New York. And found that a chimpanzee named Cecilia, who is being held captive in the Mendoza Zoo was a “nonhuman person” who had these kinds of fundamental rights to bother liberty. She issued a writ of habeas corpus and the chimpanzee was taken from the zoo and brought to a sanctuary in Brazil. So that’s an example of a situation that is almost exactly ours and while a river may not be or national park, but I think all of them are going to — are kind of moving towards the position that that judges are recognizing that personhood is detached from human beings that almost all of history, not all of all human beings were persons. Black slaves were not persons, Native Americans were not persons, sometimes women were not persons, Chinese were not persons, all kinds of human beings were not persons, so certainly the courts had never held that just being human is sufficient for being a person for hundreds and hundreds of year just being human was not sufficient. We are now in evolving situations where the courts and the parliaments are now recognizing that it’s good, certainly since World War II that all humans be persons with certain kinds of rights and many international treaties now say that, but now, they’re beginning to move on to non-humans and potentially Artificial Intelligence entities. J. Craig Williams: Real quick on the issue, one other point this court decision made is that this case does not state a cognizable habeas claim because you’re not — well the way they put it that you’re not necessarily opposed to — you’re not challenging the detention of Kiko and Tommy in this case but rather seeking to have them detained somewhere other than when they’re currently detained. So could you just address that? Steven M. Wise: We can only find that as being a kind of a bizarre sort of argument in that the court actually said that we were not arguing that the chimpanzees were being illegally detained, but if you look at the decision, it’s two sentences past a quotation from our complaint in which we ask that the court find that Tommy and Kiko were being illegally detained. What in fact our entire argument is, is that the chimpanzees are being illegally detained and what we do is we ask for the same two-step process that courts use when they’re dealing with say a human being with Alzheimer’s or you have a child who is like eight years old, and in fact, which courts had used when there was slavery when you’re dealing with a slave child, but also with all kinds of minors, who might be incarcerated, detained illegally, there’s a two-step process. The first step is, you determine the legality of their detention, which is what we’re asking that they do for the chimpanzees, but the second step is that you have to then determine what you’re going to do with the minor or with the human being who has Alzheimer’s. So the court has to make a second determination and say, you’re going to go to a mental hospital or you’re going to go — if you’re eight years old, you’re going to go into the custody of x, either a human being or a non-profit will take care of you. And that’s the exact same thing we’re asking we’re saying once you determine that they are — that Tommy and Kiko are being illegally detained then the next step is you have to determine where they should go. And we’ve been saying we suggest that they go to the fantastic chimpanzee sanctuary in South Florida called Save the Chimps, where they would live on a five acre island in an artificial lake with 25 other chimpanzees in a playset that’s close to their native Africa as possible. But it has to be – it’s really strange to imagine a chimpanzee living with 25 other chimpanzees on a five acre island when it’s the place in which they would be best able to live as a chimpanzee, best able to exercise their autonomy than any place in North America. So it’s really strange for us to see a court say, well, you’re just trying to move him from like a maximum security prison to a medium security prison. Well, it doesn’t have anything to do with that whatsoever. J. Craig Williams: Richard, what if we just take this part of the way, what if we establish say a guardian for these chimpanzees or grant some but not all rights, does that help solve some of this issue? Richard Cupp: Yeah, that’s not really part of the way because a guardian is assigned to a person. So they can see it’s the fundamental point. What we need to do, is we need to assign someone to be responsible for making sure that the chimps are cared for correctly. We just don’t make it a guardian ad litem for a person as a champ, you focus on human responsibility. I think one of the interesting questions you asked was is there a connection between this case and the possibility of personhood for Artificial Intelligence in the future. And I thought your listeners might want to hear that Steve and I may not be at one level at least too far apart on that issue; ultimately, we’re not going to come down to the same place, but we’re together — I think, and Steve, you can correct me on this, I think we’re together in the sense that that should be something that would be open for consideration the court should look. They shouldn’t be arbitrary. They should look at all of the facts that are before them to decide does this Artificial Intelligence have the capacity to bear legal duties that pull it within the community of responsibility for whom personhood is appropriate. And if the court finds that Artificial Intelligence develops sentience to the degree in which it’s a moral being, a moral agent that could be held responsible under our laws, then I think the court has to take very seriously the personhood questioned and has to decide, okay, is there some other policy reason that we haven’t come across yet to deny legal personhood to that Artificial Intelligence? If not, we probably need to apply legal personhood to the Artificial Intelligence because they can function as a responsible member of the community. Also, I thought it’d probably important too just so everybody knows kind of the status here with this talk about wild crazy decisions that are unintelligible. I think approximately 28 New York judges in a row have rejected — have participated in rejecting the three lawsuits or different versions of the three lawsuits that were originally filed and those that have followed those. Every decision has been unanimous as far as I know. So I get a little skeptical when I hear about what this court was just really, really wacky and really wasn’t making any sense. It’s 28 different judges that have chimed in on this. Steven M. Wise: Well, I have to disagree with you. It hasn’t been that, but I can tell you that there’s been 10 judges in two panels of five. In the First Department case involving Tommy and Kiko, and indeed their decisions are seriously flawed. Within the next 10 days, the Nonhuman Rights Project will be publishing an annotated decision of the First Department. It’s only four pages long, but we’re able to find approximately 40 errors, some of them being really substantial. I think the problem is that these courts are not understanding the sorts of arguments said that we are making, and eventually, they will. If they don’t in the State of New York then we’ll be bringing suits in other states. One thing by the way that Richard brought to my mind is that there already is a so-called Pet Trust Statute in the State of New York in which a case under that that involve actually five chimpanzees, the court noted that under the Pet Trust Statutes the chimpanzees had the equivalent of a guardian ad litem under the Pet Trust Statute that they were true beneficiaries, and in New York in order to be a beneficiary you have to be a person. So the Legislature of New York has already denoted not just chimpanzees but dogs and cats and other species who are used as companion animals as persons, so the nonhuman animals are already persons in the State of New York, and what we’re trying to argue is that they should not only have the right to receive money from a trust, but they should also have the right to bodily liberty by which their ability to be autonomous and to be able to choose the kind of life they want to live ought to be able to be vindicated to a writ of habeas corpus. J. Craig Williams: Well, gentlemen, this has really been an interesting discussion, but it’s time for us to wrap up and get your final thoughts as well as your contact information. So, Richard, let’s throw it over to you to summarize and wrap up and then give our listeners how to reach out to you if they would like to talk with you further. Richard Cupp: Sure. This is a fascinating subject. I think one of the things that needs to be emphasized is it’s not a silly subject, it’s something that we need to take seriously, it’s something, it’s an argument that’s going to be around for a long time. I think Steve has indicated that he is dedicated to keeping it alive for a long time, so I don’t doubt him when he says he is going to bring numerous additional lawsuits. And I think it’s really important to highlight the dangers to humans, particularly vulnerable humans, particularly humans who have low cognitive intelligence to go down the path of focusing on autonomy as a separate path toward personhood, the real determinant of whether chimpanzees or elephants or cetaceans or any other animals are treated well or not treated well is going to be humans. For good or for ill often for ill, we have the power to control their lives and make their lives miserable or to leave them alone or make their lives as pleasant as possible. We need to be focused on that human responsibility. So I am in agreement with Steve that we need to be very conscious of how we treat the animals. We need to be very serious about our responsibility toward animals. We just have a fundamentally different way of looking at what would be appropriate, and my concern is, I think well-intentioned approach is the hidden danger. I would also like to say dangers are more dangerous, I teach products liability loss, we deal with latent dangers a lot there. Dangers are more dangerous when they are not easily visible, and I am not sure that this long-term risk will jump out of people quite — really easily such that they say, oh, that’s a problem. They may say, this is a crazy idea or oh, we’ve never looked at chimps as persons before. They really need to go deeper than that and look at the policy implications which we haven’t really been able to scratch the surface of in our conversation today, but I think if we look at this as a hundred-year problem or maybe even a longer issue that we’re going to have, hopefully we will see a continuation of the strong evolution we have had in the last 10 or 20 years with regard to animal protection, animal welfare, I think we are closer to the beginning of that evolution then toward the end of it or toward the where it peaks. I think we’re going to see more-and-more concerns that we treat animals appropriately. I applaud that. My plea is that we focus on welfare and human responsibility rather than pretending that animals are people. Anyone who wants to get in touch with me, my email address is HYPERLINK “mailto:[email protected]”[email protected] and I am also on Twitter @CuppRick. Thanks a lot. J. Craig Williams: And Steve, your final thoughts and your contact information? Steven M. Wise: Sure. Thank you. No, the Nonhuman Rights Project is not claiming that nonhuman animals are people, we are claiming that that they are persons. That means that they have the capacity for certain kinds of rights, and we are seeing one of those kinds of rights is the right to bodily liberty to which they should be entitled, because they are autonomous beings so they can be able to choose how they are going to live their lives. The idea of animal welfare failed a long time ago. Nonhuman animals are essentially naked to human power, and if you don’t believe that, as lawyers why don’t you imagine that we human beings don’t have any legal rights at all. All we have is some kind of a statute that says, oh, you can’t be cruel to us or you can’t do this to us or that to us and if someone is cruel to us or this or that, there is nothing we can do about it except go to a public prosecutor and say, would you bring a criminal prosecution against that person is being cruel to us, and then when they do, it’s a criminal prosecution, but as the victim I’m not really involved. No human being would feel that she was being protected by such a welfare system. There is a reason that there has been a multi-century evolution of rights, because all legal history tells us that fundamental interests are protected in just one way, that’s by having fundamental rights that are enforceable by the person who — and I mean “person” meaning the entity who has the capacity for rights who is being injured. And so for the same reason that human beings must have rights or their fundamental interests will not be protected. So nonhuman animals who have the wherewithal to have fundamental rights, their interests can only be sufficiently protected in one way that is they have legal rights. And so, we’re beginning with chimpanzees, we think there are other nonhuman animals out there who ought to have certain kinds of rights because they have certain kinds of fundamental interests that human beings can empathize with and appreciate it. So if you want to hear more about what I do, you can go to my TED Talk, I gave a TED talk in 2015, just go to HYPERLINK “http://www.ted.com” ted.com and put my name in, Steven Wise. If you want to learn more about the Nonhuman Rights Project, we’re on Twitter, we’re on Facebook, HYPERLINK “http://www.nonhumanrights.org/”www.nonhumanrights.org is our web address, and there’s been a documentary out called ‘Unlocking the Cage’ that is a Pennebaker, D.A. Pennebaker, Chris Hegedus production. It premiered at the Sundance Film Festival in 2016 and it’s playing on ‘HBO’ now, and you can get that on ‘HBO GO’ or you can get it on iTunes, and I think it’s coming to Netflix. J. Craig Williams: Great. Gentlemen, thank you very much for being on the show today. We have really enjoyed it. Bob Ambrogi: Let me just add my thanks. It’s a really interesting discussion. Thanks to both of you for being on the show today. Steven M. Wise: You are very welcome. I enjoyed it very much. Richard Cupp: This is Rick. Thank you very much. I enjoyed talking to all of you. Bob Ambrogi: Well, that brings us to the end of the show. This is Bob Ambrogi. Thanks for listening. Join us next time for another great legal topic. When you want legal, think Lawyer 2 Lawyer. Subscribe to the RSS feed on HYPERLINK “http://www.legaltalknetwork.com/”legaltalknetwork.com or in iTunes.